I came across this article from business week (2000!) it asks the question: "What would happen if you put a computer in a public place with a high speed internet connection?" The answers are surprising. Kids (mostly 6-12) in slums who can't read English were able to draw pictures, play music and browse the net. The computer had no keyboard and was protected behind a wall, and yet it was a success. Kids used it and when they suggested taking it away the parents said "no!". A failure, in my estimation, would have been if the computer was left running and nobody used it. 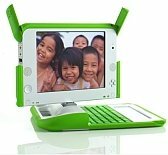 I think this bodes well for the OLPC project. The big difference is that the $100 laptop would be one kid's computer, a computer they can keep and take home. They can explore the world and their mind at their own leisure. They can download tens of thousands of books (from the Gutenberg Project, for instance) and you don't have to worry about the libraries budgetary constraints, or if someone else has already borrowed the book. You can watch a video of this project from Frontline (2002).